A while back, I got it into my head that I wanted to make Granita biscuits. I searched the web, assuming I would find a recipe – you can find anything on the web – except, it seems, a recipe for Granita biscuits. All the hits I got were from distressed expat US citizens asking where could they find Graham Crackers. Their pleas were heart wrenching. Mostly, they wanted to make a biscuit base for a cheese cake and, it appears, this cannot be done without Graham Crackers. In most cases, another expat came to their aid and suggested Granita biscuits would make a suitable (if inferior) substitute. Mmm … if Granita biscuits are a substitute for Graham Crackers then, logically, Graham Crackers may be a substitute for Granita biscuits. 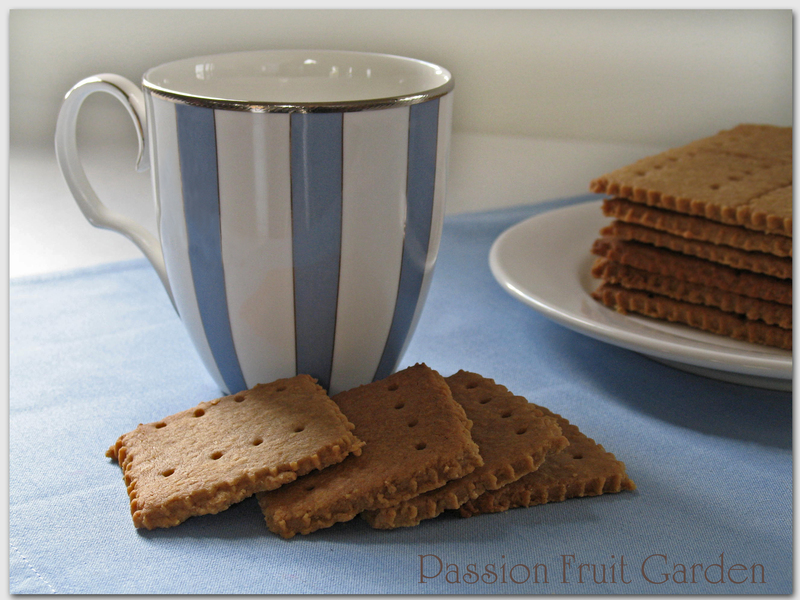 Graham Crackers are traditionally made with Graham Flour. Here is a little excerpt about Graham flour from Wikipedia. It is very interesting. Graham flour is a type of whole wheat flour named after the American Presbyterian minister Rev. Sylvester Graham (1794–1851), an early advocate for dietary reform. Graham despised the discarding of nutrients and bleaching with alum and chlorine involved in making white flour and white bread, and believed that using all of the grain (without adding chemicals) in the milling of flour and baking of bread, was a remedy for the poor health of his fellow Americans during changes in diet brought on by the Industrial Revolution. Rather than simply grinding the whole grain wheat kernel (bran, germ, and endosperm), in roller-milled graham flour the components are ground separately. The endosperm is ground finely, initially creating a fresh unbleached yellowish-white flour. The bran and germ are ground coarsely. The two parts are then recombined, creating a coarse-textured flour that bakes and keeps well (has a good shelf life). Graham flour is used to make graham crackers and pie crusts, among other things. You could probably get Graham Flour here. Bob’s Red Mill makes it and I have seen Bob’s Red Mill flours at Kakulas Sister in Nollamara, though whole meal flour and wheat germ are more readily available. Sadly, these biscuits do not taste like Granitas. The inclusion of the cinnamon does them in … but I think if you omit the cinnamon, the taste would be very similar. Not ever having tasted Graham Crackers, I have no idea if they taste like them. To me, they taste a little like mild Speculaas. I am very fond of plain biscuits and these are very, very nice. I will definitely be making these again. The recipe I follow indicated square biscuits were the go. I made mine into 12cm squares – the squares were then divided into four with the internal edges scored. The biscuits are broken into 60cm squares after they are cooked. Instead of squares, you could certainly make them round using a scone cutter. I am going to make them round next time and omit the cinnamon. Granitas, here we come! In the mean time, these are a pleasant substitute. This is an American recipe so the cups are eight fluid ounces (236 mils) but I used standard 250 mils cups and all was well. Next time Maus’ sister goes to the States visiting her son, I am going to ask her to get me some US cup measurements. The recipe comes from marthastewart.com. Whisk the flours, wheat germ, salt, bicarb soda, and cinnamon in a medium bowl. Set aside. In an electric mixer, mix the butter, brown sugar and honey until pale and fluffy. Reduce speed to low. Add the flour mixture and mix until combined. Turn out dough onto a floured surface. The dough should be quite dry but moist enough to form a ball. If it’s too dry, add a drop or two of water. The ability of flours to absorb moisture varies so always hold back a bit of the water, adding the balance, and a bit more, if required. Roll out the dough. I intended to use my pasta maker to roll the dough but it didn’t work. I had to use a rolling pin. The dough is quite crumbly so it would be hard to roll out all the dough as one. Divide it into four or five pieces and roll out each piece separately. Roll a piece into a square. Using a fluted pastry wheel, cut out a 12 centimetre square of dough. Divide the square into quarters. Press lightly, when making the internal lines so as not to cut all the way through. Once formed, put the biscuits in the fridge until firm. Pierce the crackers using a fork. Bake, rotating halfway through, until dark golden brown, 8 to 9 minutes. The trick is to ensure the biscuits are dry but not too brown. After the baking time ended, I turned the oven right down and left the biscuits in there for a further 10 minutes to dry them out. Let the biscuits cool on the tray for five minutes then transfer to wire racks to cool completely. This entry was posted in Biscuits & Slices, Sweet Things and tagged Graham flour, Granita recipe, Home made Granitas, Recipe for plain biscuits by Glenda. Bookmark the permalink. I love Granitas… plain, dunked in tea or with a smear of butter. A childhood favourite but even now a packet in the cupboard from time to time doesn’t go astray even if not used as a cheesecake base… I agree, pretty much any crumbled sweet/semi-sweet plain biscuit works… My aunt’s leming meringue pie uses shortbread. Hi Ella, I am going to make English digestive biscuits next to see how close they are to Granitas. Well I’m not sure what Granitas taste like but grew up with graham crackers as a mainstay snack dipped in milk as a kid. We do tend to use them a lot for crusts & I have an awesome recipe for a chocolate torte that uses chocolate graham crackers for the crust. My hat’s off to you for even taking on this challenge. Granitas are a plain, whole wheat, commercial biscuit. I am going to give them a go. I have to say how happy I am to have brought my US measuring cups and spoons with me!! I use them often. The cups I have also have metric markings on them which is helpful as well. I’m not a huge graham cracker person but they are great for pie crusts. Here in Perth I find them at the Asian shops. They are similar to what we get in the US though they aren’t as good as the Honey Maid brand avail in the US. Hi Lauren, how different are they to Granitas? I ended up in a discussion about graham crackers today (with some american friends) and yes they were waxing lyrical 🙂 Having never tasted Graham crackers or yourGranita biscuits I’m of no help. But lik eyou I do like a plain biscuit, and you’ve given me a great tip about using a pastry cutter so you can have nic efluted edges. Thank you Glenda! Hi Claire, you are welcome, fluted edges are definitely the go. Well Graham Crackers. I used to have these as a kid and loved them. Whenever we went camping we would use them and have what are called S’mores. You take a Graham cracker top it with chocolate(Hersey bar) and melted marshmallows, top with another cracker and you have a S’more. Memories from my childhood have just come flooding back, the best camping food there is!!! Have a look on google. Hi Sandra, I am really going to try to come up with a recipe for Granitas. I am thinking, white sugar and less of it, less butter, more fibre and no cinnamon. We will see how I go. Nice one, and interesting too! Hi Debi, we use any old plain commercial biscuit. Do you have Granitas in the UK? I’ve not seen Granitas here, but I’m sure you can get them in places that specialise in Aussie goods. They are said to be similar, but slightly sweeter than UK digestive biscuits. How strange that Graham crackers are not known here in Australia. Now I can imagine the taste…. wholemeal, buttery, cinnamony and rather sweet kind of crackers. Thank you for the recipe, it is worth trying. I think my hubby will like them, being a Dutch, speculaas is his favourite. Hi Lois, thanks for stopping by and commenting. The more I think about it the more I think Granitas are our equivalent. I think I would have to replace the brown sugar with white sugar as well as omitting the cinnamon. I am going to give it a go.